Optimize performance for big data, clouds and Web 2.0 with multi-rate, flexible solutions supporting 10/25/40/50/100GbE throughput. 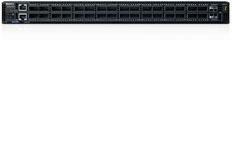 Dell Networking Z-Series of core/aggregation switches provide optimal flexibility, performance, density and power efficiency for your data center. Offering a range of fixed-form-factor switches, the Z-Series is designed to deliver high performance for today's demanding workloads while providing headroom for future data-center demands. Dell Networking Z-Series switches not only simplify manageability, they give you the flexibility to stay ahead of data needs rather than react to them. 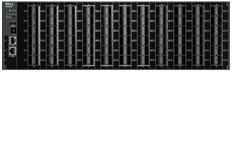 Optimized leaf/spine architecture with Z-Series switches supports data centers of virtually any size, with up to over 100,000 servers. Exceptionally high density with the Z9100-ON and Z9264F-ON providing up to 128 x10/25GbE ports in a single switch — 7X density per rack unit over the Cisco Nexus 9504 Series switches..
For mid-sized to enterprise data centers, pay-as-you-grow licensing or multi-rate options can mean the difference between being leading edge or falling behind. Right out of the box, Z-Series switches give you scalable performance on demand. Choose Dell’s premium support service, ProSupport, for 24/7* direct telephone and online access to advanced-level technicians based in your region. Whether you have one office or hundreds around the world, protect your investments with this simple yet flexible approach. This open networking, SDN-ready fixed form factor switch is purpose-built for applications in high-performance data centers and modern computing environments. This powerful, high-density core switch offers pay-as-you-grow pricing and built-in Dell support for large virtualized and cloud networks.